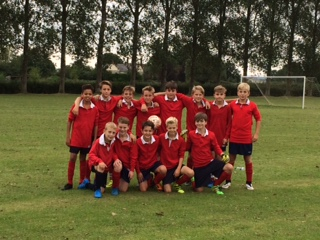 U12 Boys Nationals Football played their first round of the cup at home against The Park School Yeovil. Right from the start Hugh Sexey's team was clearly the stronger side and started to score goals straight away. The quality of football and team effort were superb; we were playing like Barcelona: keeping the ball moving and creating lots of passes before scoring a goal. Goal Keeper Aidan Scoulding only touched the ball once in the first half. Goals from George Moss, Ethan Floyd, Oscar Boorman and Jacob Aberdeen put Hugh Sexey comfortably in the lead at half time. Changes were made at half time as we were able to move players around and give everyone in the squad a decent game. In the second half Hugh Sexeys continued to pressure The Park School and we scored more goals. Thomas Bean, Ben Caldwell, and Henry Flanagan came off the bench and put in good performances throughout the second half. The back trio of Ed Gillions, Will Creaser, and Ben Crook didn't put a foot wrong, and were solid when The Park School attacked. The four midfielders - Sam Callow, George Moss, George Nuttycombe and Oscar Boorman - looked to be a real dream team in midfield, and provided great support for our goal machines, Jacob Aberdeen and Ethan Floyd, who were able to show their finishing skills. A great start to the season. Thank you to Park School for travelling to HSMS, and for continuing to play until the final whistle.